« T-shirt coupon codes – save up to 20% when buying tees online! Teezine rewarded best T-shirt designs and clothing brands in 2010 with gold, silver and bronze medals in four categories! 2010 is over very soon and we here at Teezine wanted to see it with some style. Therefore we picked best T-shirt designs, clothing lines and online shops in 2010 through our first Teezine T-shirt Olympics! That’s right – we rewarded tees & lines we featured in 2010 on our blog with gold, silver and bronze medals in four categories: best online clothing shop, best new clothing brand, best sample T-shirt and best T-shirt design . We’ll start with the first category – best T-shirt design! There are three main aspects we considered whed deciding which online shops are the best in our opinion: offering, navigation easiness and overall impression. Of course there are many more great online clothing shops out there, however we made the following decision. There were many clothing brands conceived in 2010 and some of them are already dead. We really love new lines popping out and we wouldn’t want any of our medalist to vanish any time soon. Main aspects we considered in this category were: brand concept, designer signature and offering. Our favourite and yet the most complicated category! It was very difficult to decide which samples get our medals, since we really l-o-v-e all sample T-shirts sent for a review. Therefore we considered these aspects: design concept, print quality and shirt quality. 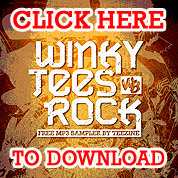 And finally – the best T-shirt designs in 2010 by Teezine! In this category we concentrated on three main aspects: design concept, creativity aspect and final execution. These three T-shirt designs got highest rankings by us. Hope you love all shirts and brands featured here as much as we do. Make sure to check ’em out all by clicking on above pictures. We’d like to thank all of you Teezine readers, people who we made contacts with and all others who took an interest in our lil’ blog for making 2010 our best year so far! Best wishes to all of you! Glad you liked it! It’s a special category for Also and me because we love trying the samples on and review them. These were also picked as most worn by us. Except for Meanie Wear T-shirt I wear for days now 🙂 Check their review soon! Great selection of brands & shirts! We’re very honored to win a Gold!!! I yield in the presence of the Gold Medal winners. Great work.